On the Measles Outbreak: Does the ‘Modern’ Anti-Vaccination Movement Remember Smallpox? The Cow-Pock, by British satirical cartoonist James Gillray. I wonder whether the parents of the unvaccinated would consider doing away with traffic regulations or traveling by horse and buggy? Societal living needs written and unwritten rules and regulations. It was humanity’s good fortune that Edward Jenner (1749-1823), an English country doctor, listened to a milkmaid who told him that she could not catch smallpox because she had had cowpox. Smallpox is a very ancient disease that killed Ramses V more than three thousand years ago. It has a mortality rate of 30% and, because it is airborne, it is infinitely more infectious than Ebola. Toward the end of the eighteenth century it killed 30,000 Englishmen annually. Many of those who survived were permanently disfigured. Jenner tested the milkmaid’s folk remedy, and proved its veracity. In people cowpox is a mild disease. Dairy farmers whose scratched hands came in contact with the serum that oozed from a sick cow’s pox, caught cowpox and thereafter proved immune to smallpox. In 1796 Jenner harvested a bit of matter (serum) from a human pox that had formed on the hand of another dairymaid. He rubbed it in a scratch he had made on the arm of eight-year-old James Phipps. The boy developed a big pox, but remained fit. Six weeks later Jenner tried his very best to infect James with smallpox. But the boy was immune. Jenner called the process vaccination, a term derived from vacca, the Latin name for cow. Then as now, some people were skeptical. 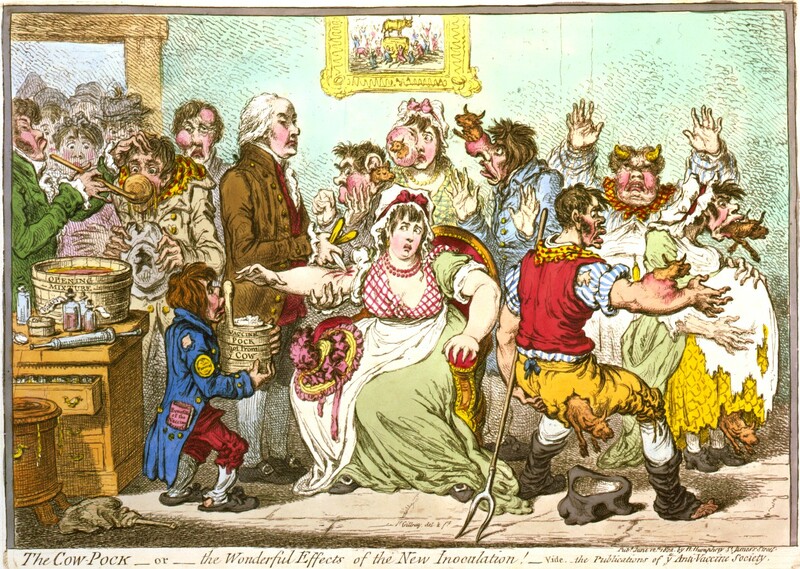 In 1802 James Gillray published the above cartoon that illustrated the “cowyfying” effects of this vaccine. Nevertheless the vaccine has saved billions of lives. The world quickly adopted vaccination. Within a few years Napoleon had his entire army vaccinated. In 1799, 23-year-old Thomas Jefferson traveled to Philadelphia to have himself vaccinated; soon thereafter he saw to it that his entire household was similarly protected. The discussion of whether or not to make vaccination compulsory has waxed and waned ever since. There was however enough worldwide legislation to force compliance, and in 1980 WHO declared smallpox an extinct disease. It took many decades to understand the nature of infectious diseases, how diseases were transmitted and why Jenner’s vaccine worked. It took even longer to develop drugs and vaccines to treat these. Most of the vaccines to treat common diseases—chicken pox, mumps, polio, yellow fever, influenza, some forms of pneumonias—date from the twentieth century. The discovery of each took gifted, hard-working scientists. They had to identify the causative agent, most often a virus, grow it, and then weaken it so that it could be administered to patients without causing the full blown disease. The measles virus was particularly difficult to grow and tame. The task fell to John Enders and his team at Harvard. It needed live cells to grow in and it took Enders years to develop the so-called tissue culture technique required to grow certain picky viruses. Enders’s technique was so world-shaking it earned him a Nobel Prize in 1954. Jonas Salk and Sabin used Enders’s technique to develop the polio vaccine in 1952. It would take Enders another six years to develop the measles vaccine. In its heyday measles was an especially bad disease, killing some of its victims, frequently causing blindness, encephalitis, heart disease in others. Even in 2011 it caused 158,000 deaths in underdeveloped countries. It had practically vanished in the United States. The reason that it is important to vaccinate the great majority of the population is that infectious agents survive by infecting susceptible hosts. When they can’t find a susceptible host they vanish, as the smallpox virus did. Yes, I believe that the government or other agencies have the right and the duty to require its citizens to be vaccinated. We do need certain laws to keep functioning. Like most everybody else, I hate too much government interference, yet I expect those I elect and pay, to see to it that my water is clean, that they see to it that my neighbor and I dispose of our garbage, and that they do what they can to keep my children and me healthy. I also hope that scientists discover more vaccines. Who would not love one against cancer, AIDS or Ebola? Suzanne Loebl’s first book, Fighting the Unseen: The Story of Viruses, was published in 1968. This entry was posted in politics and tagged disease, Edward Jenner, health, healthcare, John Enders, measles, medicine, public health, smallpox, vaccination, vaccines, viruses. Bookmark the permalink. 1 Response to On the Measles Outbreak: Does the ‘Modern’ Anti-Vaccination Movement Remember Smallpox?